Graphene Battery Market size was over USD 15 million for 2015 along with 20% CAGR estimation by 2024. Europe has witnessed substantial increase in the sales of electric vehicles over the past 4 years. More than 150,000 electric vehicles were sold in Europe for 2015, up from 70,000 electric vehicles in 2014. Rising demand for portable electronic devices will drive global graphene battery market share, with over 65% of the U.S. adult population owing a portable electronic device during 2015, up from 35% in 2011. Ongoing research to increase the shelf life, efficiency and quality will drive industry share. Strict government regulations to curb carbon footprint has stimulated the graphene battery market share, with these products classified as low emission versions. In 2008, the U.S. EPA introduced the National Emission Standard for Hazardous Air Pollutants (NESHAP) to regulate the battery manufacturing process. NESHAP section 112(c)(3) lists battery manufacturing area to be regulation pursuant as it involves use of lead and cadmium. Graphene Stakeholders Association (GSA), a worldwide non-profit organization is working with Nanotechnologies Technical Committee (TC229) and International Organization for Standardization (ISO) to introduce standards for producing dependable, efficient and user-friendly products. Introduction of standards will stimulate the graphene battery market during the forecast period. Standardization will restructure the industry demand in an organized manner. Lithium ion industry segment was valued over 9 million in 2015 and is likely to see strong gains during the forecast period. It finds its wide applications in various end use industries including automobiles and healthcare. Global graphene battery market share from supercapacitors will witness substantial growth during forecast period. Supercapacitors possess superior charging abilities and greater shelf life, making them commercially viable product for investors and customers. Cellphone manufacturers are increasingly adopting supercapacitors as it increases the operating life of the product. Demand from automotive applications was over USD 4 million for 2015. Stringent government regulations to curb automobile emissions will encourage the adoption of electric and hybrid vehicles. Graphene battery market share from healthcare applications will surpass USD 25 million by 2024 subject to growing portable medical devices demand. Increasing emphasis on portable medical devices in developed countries will stimulate the business growth. The electronics industry accounted for over 30% of the 2015 global industryrevenue. Aerospace and Defense applications are likely to witness strong growth owing to increased defense expenditure in developed nations. Industrial robotics is an upcoming application avenue and will witness gains of over 10%. 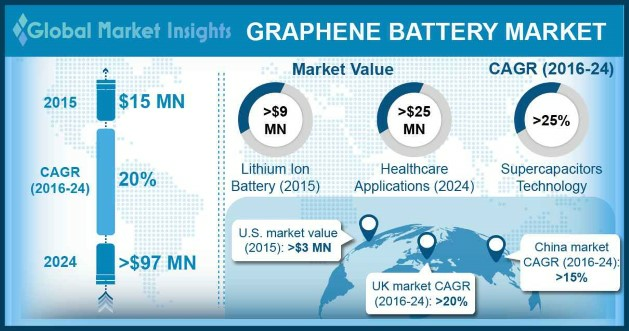 U.S. graphene battery market size was valued above USD 3 million in 2015 and looks set to grow significantly, subject to its high quality at affordable prices. Adoption of electric vehicles in the U.S. increased from over 5000 in 2011 to over 70,000 in 2015 subject to increasing government subsidies and growing environment awareness among customers. The 2015 China market size was valued over USD 1 million and will witness growth over 15%. China is likely to experience significant increase in manufacturing capacity, upwards of 2,000 tons per year. Japan market size will grow over 25% from 2016 to 2024. Established distribution channels coupled with increasing customer awareness will positively impact the sector. Japan was one of the first countries in the world to adopt electric vehicles for public transport. Norway market share is likely to witness strong growth owing to high penetration of electric vehicles coupled with favorable government initiatives towards adoption of low emission technology. More than 20% of automobiles in Norway are electric or hybrid vehicles, and the government intends to subsidize the industry to further reduce the carbon footprint. UK graphene battery market size for 2015 was valued at over 2 million and will witness a significant growth during forecast period. The government has introduced strict regulations on the use of batteries with bio-hazardous content, propelling demand. A few key global graphene battery market players are Cabot Corporation, Group NanoXplore, Graphene 3D Lab, Graphenano, SiNode Systems, Graphene NonoChem, XG Sciences, Cambridge Nanosystems etc. Competitive pricing strategies and a shorter lead time in delivering products are key strategies proving advantageous for local manufacturers. In 2015, XG Sciences announced a strategic investment made by Samsung Ventures, to fund research into more effective use of graphene for greater commercial use. Also, Canada-based Grafoid acquired Braille Battery and Alcereco Inc., substantially increasing their research and development capabilities. Graphene is touted as a ‘wonder material’ by researchers because of its ultra-light weight and superior charging capacity. Increasing growth in graphene battery market demand will disrupt the global battery market and is likely to change the industry over the next decade. Increasing use of graphene in new applications like water desalination plants to production of efficient light solutions may further complement the industry outlook over the forecast period.